When we first moved back to the farm our girls were 10 and 15. A few weeks before that first Christmas here we hit on the idea of making lefse to sell for a little extra Christmas cash. 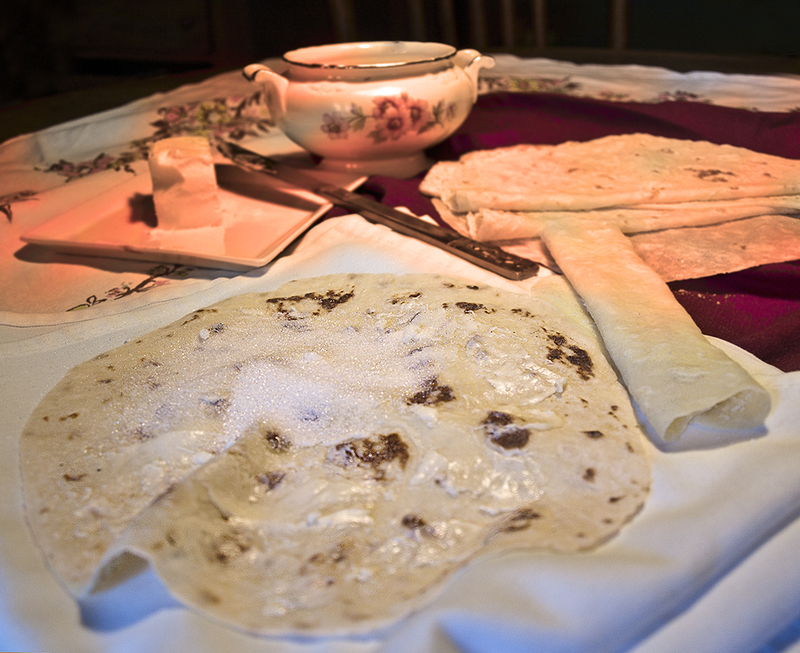 Up till then lefse was a commodity we always had during the holidays, true to our Norwegian heritage, but it came from somebody else. I’d never made it, or even seen anybody make it, unlike my husband. 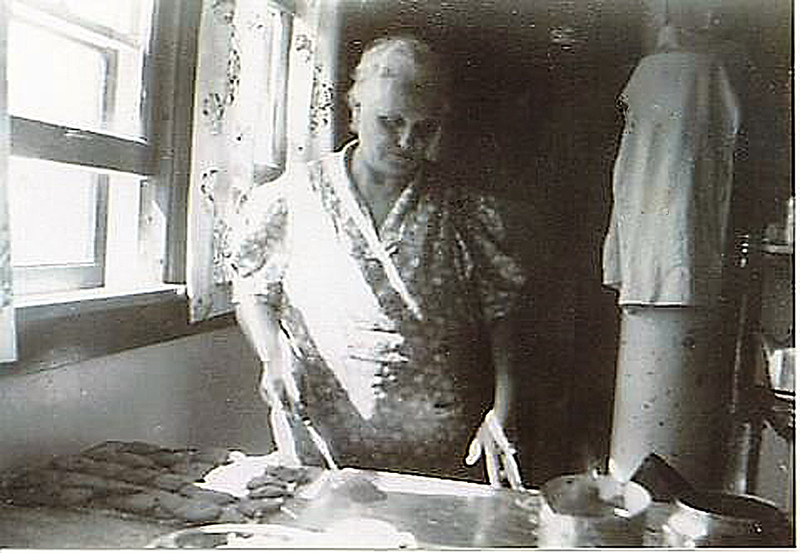 As a kid he was frequently called upon to bake the pieces on the griddle as his grandmother, and sometimes his mom and an aunt or two, rolled them. Grandma Anna set the bar. The girls and I did our best to meet the challenge. And it worked. They did it all and we sold it through the grapevine. My husband joked it was our drug pipeline. If you wanted some, you mentioned it to someone else, who told a couple other people until word finally got back to us. Eventually the girls got old enough to look for work elsewhere and I had to take over filling orders. So this recipe comes to you with all the kinks worked out. Some specialized equipment is needed, which you can likely find at your local hardware store or Walmart. Links are provided at the bottom of this post to some online sites selling griddles, turning sticks, boards, and ricers. 1. Boil the potatoes until tender, taking care not to cook too long. Mushy potatoes will make unforgivingly sticky dough and you’ll never want to try this again. Russet or Yukon Gold potatoes work the best. Red potatoes tend to make a stickier dough. 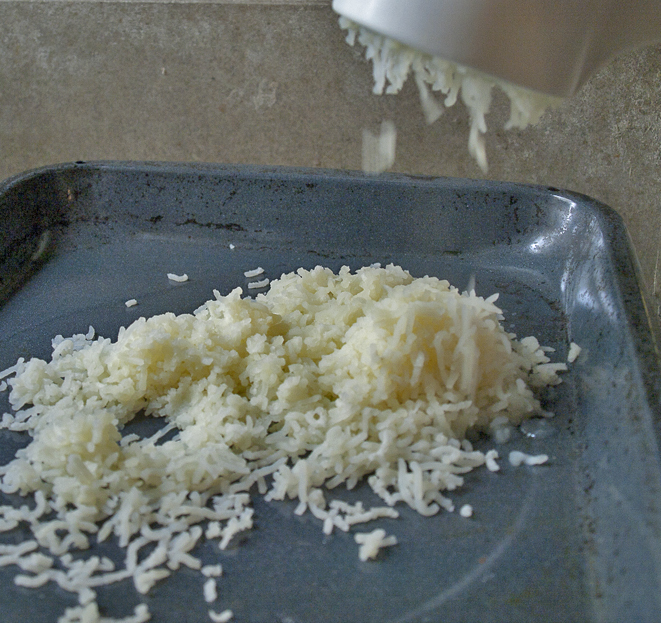 Drain the potatoes and rice or mash by hand while hot. We avoid using a mixer because it’s too easy to whip it into a sticky mess. Layer the riced potatoes on a flat pan and set aside to cool completely. 2. Mix the half & half and melted butter into the cooled potatoes. At this point you can refrigerate the mixture in a covered bowl for several hours or overnight. When you’re ready to bake, add the flour and salt. DO NOT ADD EXTRA FLOUR. 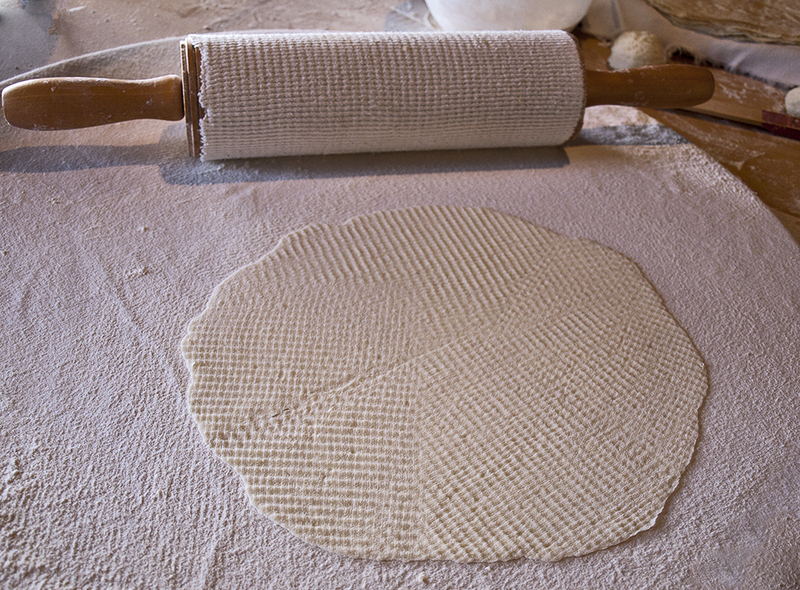 This is a soft dough and you’ll be using more flour when you roll out the pieces. Extra flour added now will only make the cooked lefse dry. We use a #20 cookie scoop and get about 20 dough balls from this recipe. Once you’ve added flour to the potatoes, you’re committed. Letting the dough sit around very long now makes it even stickier. So divide it into dough balls and place them on a flat pan in the refrigerator. 3. Preheat the griddle to 500°F. Prepare a landing area for the finished pieces by covering a cooling rack with a cloth towel or napkin. Cover the rolling pin with a cotton sock and the board with a cotton cover. Flour the pin and board generously. 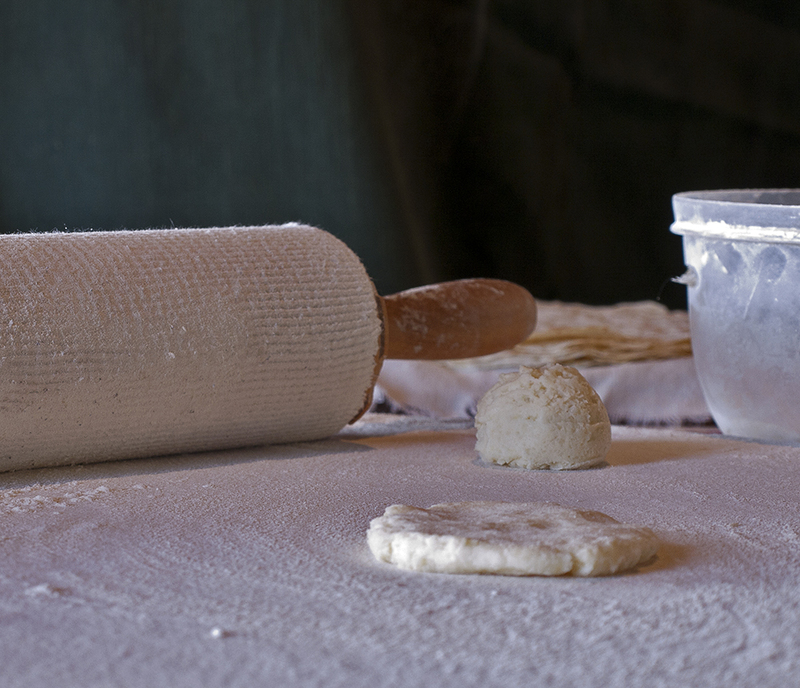 Taking out just a few dough balls at a time, take one and flatten it slightly with your hand. Roll out as you would do with pie dough, from the center out in all directions. When it’s roughly 4-6″ across, slide the turner under it and turn it over, sprinkling more flour on the board as you flip it. Continue rolling until it’s very thin and about 9-10″ across. Use the turner to pick it up and transfer it to the hot griddle. No need to grease the griddle. 4. After about 45 seconds you’ll notice small bubbles on the surface. This is your cue to turn it over. Another 45 seconds or so and it should be done, hopefully looking something like the photo at right. It may or may not show some brown spots. Electric griddles maintain temperature by cycling on and off. When it cycles down it’s still plenty hot to use but things don’t brown as well. 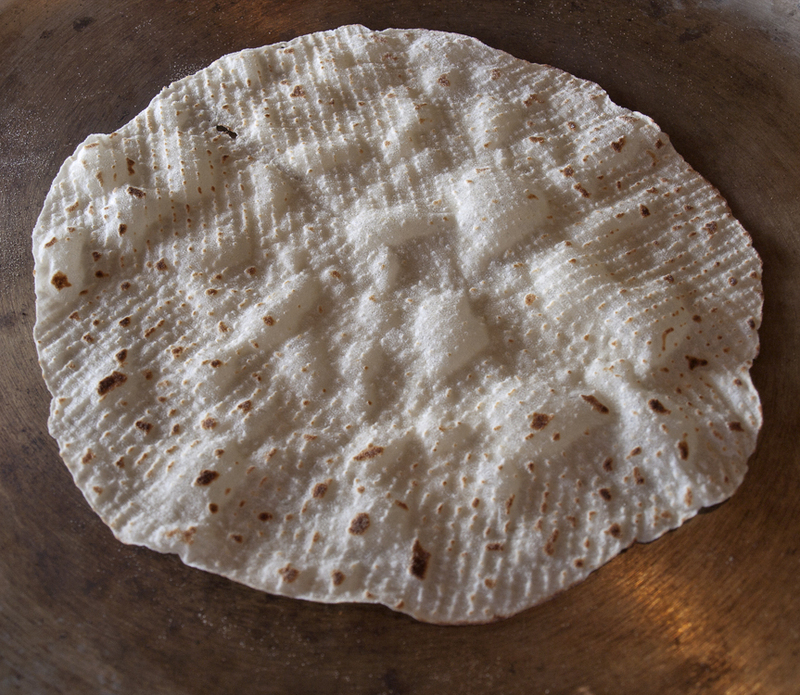 Don’t be tempted to leave the lefse on longer because of it. It will overcook and become brittle and dry. Total baking time is 2 minutes or less. If it takes much longer your grill isn’t hot enough. I’ve also noticed that Teflon coated griddles don’t brown as well as those that are uncoated. In spite of all my warnings about stickiness, you don’t need the Teflon coating. 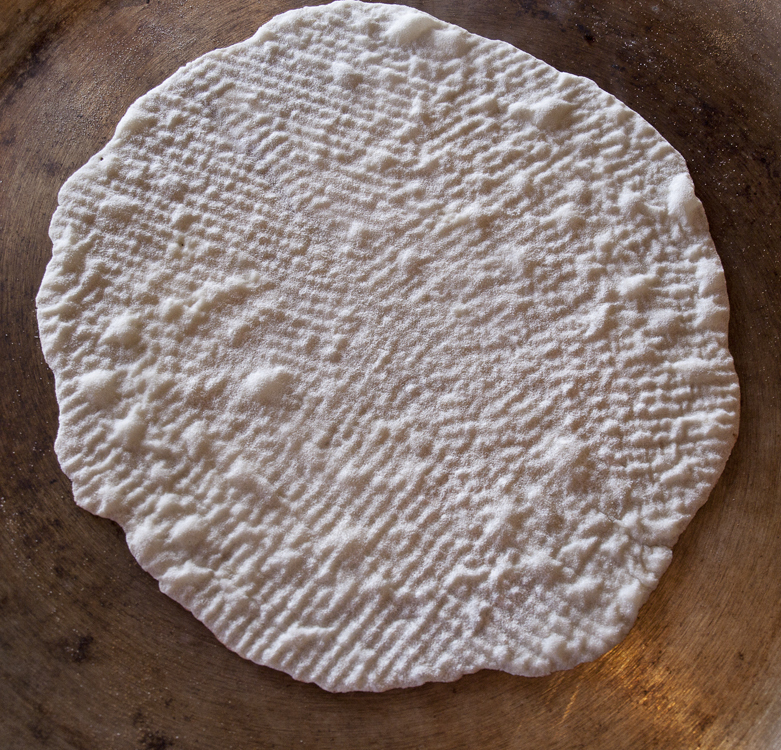 Lefse bakes so quickly, on such a hot surface, that’s not a problem. I’m still using my mother-in-law’s griddle and it has to be at least 40 years old. I’ve had to replace the probe a couple of times and there is a small hot spot to work around, but it still works better than the newer Telfon-coated one. 5. As you bake, place the pieces on the covered cooling rack. You can stack them on top of each other, they won’t stick together. Since I sell by the dozen I make stacks of 12. Cover the stack with another towel and set aside to cool completely. Once cooled you can either fold each one as you wish, or fold stacks of 6, and place in food-grade plastic bags. Lefse freezes well, too, so double-bag in freezer-weight bags if you’re planning on saving them. Otherwise store them in the refrigerator if you’re not eating it immediately. The pieces are (hopefully!) very thin so they do dry out fairly quickly. A quick warm in the microwave will restore it to its just-baked deliciousness. 6. 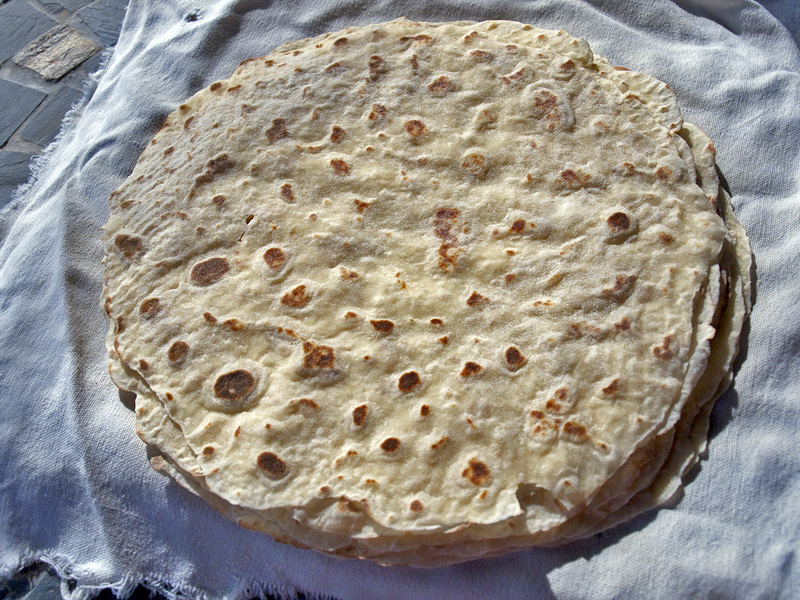 There are as many ways to enjoy lefse as there are Norwegians, but here are some suggestions: always with butter, then sprinkled with sugar, brown sugar (my personal preference) or cinnamon and sugar; no sugar, just butter; topped with jelly; or as my dad liked it, with lutefisk rolled up in it. You’ll have to look that up if you’ve never heard of it. Stuff of legends. Happy eating! This is a great recipe! Used it last year for the first time. Thanks Joan.